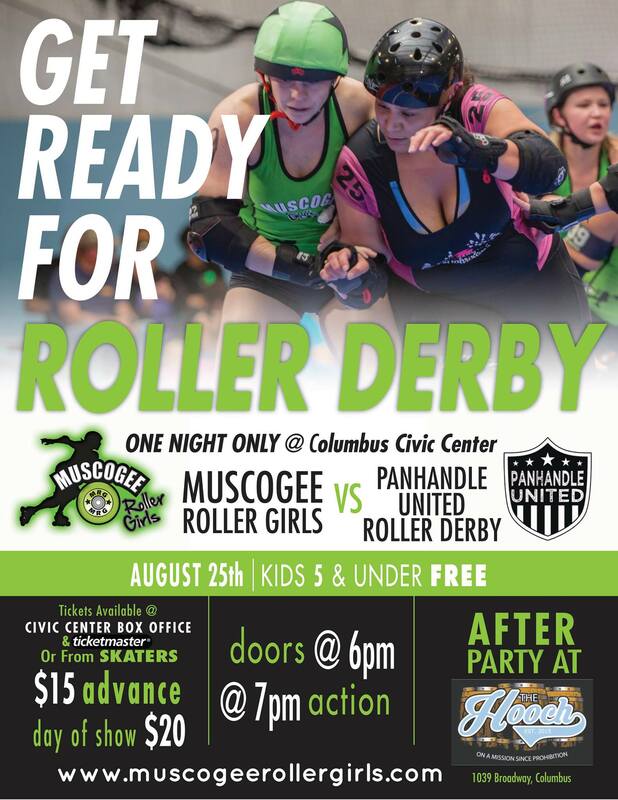 Muscogee Roller Girls are back for one night only! You don’t want to miss this-action packed event so get your tickets soon! The Panhandle United All-stars are traveling from Fort Walton Beach, FL to match up with one of their fiercest competitors, the Muscogee Roller Girls. These two teams have quite a history of competition between them and the action will be fierce as Panhandle United tries to hold on to their winning streak and MRG hits the track looking for redemption after their loss to Panhandle at the Low Down Throw Down Tournament in Augusta, GA earlier this year. It was a close game for these long-time rivals and recent shake ups to both their line ups are going to make it anyone’s game. Advance tickets are available through Ticketmaster, the Civic Center Box Office or any MRG skaters. Advanced Ticket Prices are $15, day of it rises to $20 so get your tickets now. You can save on Ticketmaster fees by purchasing at the Civic Center Box Office or from a skater. We will have a half-time show featuring a soon to be announced local entertainer, some fun gift baskets up for raffle but the fun doesn’t stop there! Join us after the game Downtown at The Hooch for a victory celebration, beer pong, and dancing.